Gone are the days when tablet computers used to be slow, underperforming devices. Modern tablet computers are powerful gadgets that are capable of holding their own against traditional computing devices such as laptops. In some cases, they can even replace laptops. Today, many businesses have (or are in the processing of including) tablet computers as a core component of their IT infrastructure. They can be especially beneficial for small establishments. For instance, a restaurant may equip its waiting staff with tablets, so that they can show the menu to the customers and have them place their orders directly online. Similarly, a store may use tablets preloaded with customized apps, which the customers can directly use to scan the identifying info (e.g. barcodes) of the products in their shopping cart. And cashiers can use tablets to ensure speedier checkouts. Depending on your (or your organization’s) requirements, there are countless business-oriented tablets to choose from. They come in a multitude of sizes and run different operating systems, which make deciding on one even more confusing. So to help you out, we’ve rounded up the best tablets for business. Read on to find out all about them. Apple’s hugely popular iPad family of tablet computers includes a handful of products, with all different sizes and specifications. Of these, the 12.9-inch iPad Pro is definitely the best tablet out there. The iPad Pro is powered by Apple’s A10x Fusion chipset with 64-bit desktop class architecture. It’s helped by the M10 motion coprocessor, which collects and processes data from the device’s numerous sensors even when it’s asleep so that apps can quickly retrieve the data. This helps in saving battery life. There’s also 4GB of LPDDR4 RAM and 64GB (base) of internal storage, enough for all your multitasking needs. Speaking of which, the large screen of Apple iPad Pro allows it to make full use of iOS 11’s enhanced multitasking capabilities, and other features such as drag and drop. What makes the iPad Pro the best business tablet is support for Apple Pencil (sold separately), which can be used to do everything from taking notes to annotating business charts. You can also get the Smart Keyboard accessory, which transforms the iPad Pro into (kind of) a laptop. Apple iPad Pro includes Touch ID fingerprint sensor for enhanced security, as well as all major connectivity options (802.11a/b/g/n/ac Wi-Fi and Bluetooth 4.2). There’s also a variant with support for cellular networks, so you can remain online even on the go. For imaging and video calling duties, the iPad Pro has a 12MP (f/1.8) with 4K video recording capabilities, as well as a 7MP (f/2.2) FaceTime HD camera. Other goodies include dual microphones for audio recording​ and four speakers for an immersive multimedia experience. Since it runs iOS 11, the 12.9-inch iPad Pro has access to millions of productivity-centric apps from the App Store. For those of you who prefer a more open digital ecosystem, the world of Android offers some great business-oriented tablet computers, with Samsung’s Galaxy Tab S3 being the best of its kind. Delivering horsepower to the Galaxy Tab S3 is a Qualcomm Snapdragon 820 SoC, with a quad-core CPU and Adreno 530 GPU. There’s also 4GB of LPDDR4 RAM, allowing you to juggle between project presentations and spreadsheets without any issues. The tablet computer has 128GB of internal storage​ and supports microSD cards of up to 256GB. Samsung Galaxy Tab S3 has a 9.7-inch touchscreen display, ideal for working with all kinds of productivity applications. With a resolution of 2048 x 1536 pixels, the S3’s Super AMOLED panel is both sharp and vivid. The tablet runs Android 7.0 Nougat, which includes enhanced split-view multitasking features and bundled app notifications. With the included pressure-sensitive S-Pen, you can annotate documents, jot down notes and more. You can also purchase a keyboard accessory for a better typing experience. As far as connectivity options are concerned, the Galaxy Tab S3 includes 802.11a/b/g/n/ac Wi-Fi, Bluetooth, USB Type-C 3.1 and LTE (optional). There’s a 13MP (f/1,9) camera (with 4K video recording support) at the back, in case shooting some photos/videos with a tablet is your thing. A 5MP (f/2.2) front-facing shooter takes care of video calls. You also get four speakers for a great audio output. Samsung Galaxy Tab S3 is backed by a 6,000mAh battery with fast-charging support. Any discussion about enterprise-ready computing devices is (and will always be) incomplete without the legendary ThinkPad name. As it stands, Lenovo’s ThinkPad X1 is the absolute best productivity-focused tablet money can buy. Powered by Intel’s 7th-gen Core i5-7Y57 processor, the X1 can run anything you throw at it with ease. There’s also 8GB of LPDDR3 RAM for effortless multitasking, and a 256GB SSD ensures that even the heaviest programs open up in a snap. It has a 12-inch IPS LCD touchscreen display, with a resolution of 2160 x 1440 pixels. The included stylus allows you to do everything from annotating images to signing documents and has full inking support for Office apps. Since it runs full 64-bit Windows 10 Pro, Lenovo ThinkPad X1 is more of a 2-in-1 hybrid than a standalone laptop. Even though this alone gives it an edge over its rivals, what truly sets the X1 apart from the crowd is its innovative modular design. You can attach the productivity module to extend the device’s battery life, hook up the presenter module to have the X1 project a 60-inch display and more. Of course, you also get all standard connectivity features such as dual-band Wi-Fi, Bluetooth and 4G LTE. The I/O ports include USB 3.1 (x1), USB 3.0 (x1), Ethernet and Mini DisplayPort. Lenovo ThinkPad X1 is backed by a 2-cell battery. Ever since it debuted in 2012, Microsoft’s Surface lineup of hybrids has completely redefined the scope of tablet computing. Now in its fifth generation, the Surface Pro (2017) is better and more powerful than ever. If money is no constraint, this is the business tablet you should get. Truth be told, Microsoft Surface Pro only looks like a tablet. In reality, it’s a full-blown computer, packing innards formidable enough to challenge the mightiest of laptops. It’s powered by Intel’s 7th-gen Core i7 processor, paired with 16GB of RAM. A 512GB SSD not only gives you enough space for all your files but also ensures that even heavy applications start up super fast. The Surface Pro has a 12.3-inch PixelSense display with 10-point multitouch support. With a resolution of 2736 x 1824 pixels, the 3:2 aspect ratio panel is perfect for working with productivity programs like Microsoft Excel. The Type Cover accessory makes even extended hours of typing an enjoyable experience, thanks to well-spaced keys. You can also purchase the Surface Pen for all your annotation and presentation needs. For connecting external peripherals, Microsoft Surface Pro includes USB 3.0 (x1), a microSDXC card reader, Mini DisplayPort, Surface Connect, Cover port and a 3.5mm audio port. There’s also 802.11a/b/g/n/ac Wi-Fi and Bluetooth 4.1 on board. In the imaging and video department, the Surface Pro comes with an 8MP rear (autofocus, Full HD video) camera and a 5MP front (Full HD Skype video) camera, which supports Windows Hello face authentication. You also get dual microphones and 1.6W stereo speakers with Dolby Premium audio support. Backed by a one-year limited hardware warranty, Microsoft Surface Pro runs Windows 10 Pro. If you want a business-grade tablet that doesn’t cost a fortune, look no further than HP’s Elite X2 1012 G1. Powered by an Intel Core m5-6Y54 (1.1GHz clock speed, Turbo up to 2.7GHz) processor, the Elite X2 comes with 8GB of DDR3 RAM and a 256GB SSD. The hardware makes it more than capable of effortlessly handling day-to-day office tasks, and then some. The convertible has a 12-inch Full-HD display, with a resolution of 1920 x 1280 pixels and 10-point multitouch support. The display is protected with a layer of Gorilla Glass 4, which helps it stand up against scratches and all other kinds of damage. For wireless connectivity, HP Elite X2 1012 G1 has 802.11ac Wi-Fi and Bluetooth 4.0. Other I/O ports include USB Type-C (x1), USB 3.0 (x1), a multi-format card reader and a 3.5mm combo input/output audio port. The tablet module has a funky-looking kickstand at the back, which lets you easily prop it up on any surface. The Elite X2 comes with a detachable keyboard and even includes HP’s Active Pen Stylus as part of the package. There’s a 5MP rear camera and a 2MP front-facing camera, as well as speakers tuned by Bang & Olufsen. Running 64-bit Windows 10 Pro, HP Elite X2 1012 G1 is backed by a 40Wh battery and weighs 1.85 pounds. Despite being primarily known in the hardware space for their Kindle family of e-readers, Amazon also makes some pretty great Android-based tablets marketed under the Fire brand name. If you’re on the hunt for the perfect budget tablet for your business needs, the Fire HD 10 might just be what you need. Packing a 10.1-inch Full-HD (1920 x 1200 pixels resolution) touchscreen display, Amazon Fire HD 10 is powered by a 1.8GHz quad-core processor and 2GB of RAM. There’s also 32GB of internal storage, with support for microSD cards of up to 256GB in size. Amazon claims that the Fire HD 10 is more durable than Apple’s 10.5-inch iPad Pro. The standout feature of Amazon Fire HD 10 is its built-in handsfree Alexa capabilities. In case you don’t know, Alexa is Amazon’s virtual assistant that also powers the company’s Echo lineup of smart devices. Thanks to hands-free functionality, you can have Alexa read you the news, play your favorite song and more, without even picking up the tablet. The Fire HD 10 features deep integration with Amazon’s content ecosystem, which allows you to have access to unlimited ebooks, streaming music and videos and apps. Of course, you also have access to all the apps that Android has to offer. Connectivity options on the Fire HD 10 include Wi-Fi, Bluetooth, USB 2.0 and 3.5mm audio. You also get a 2MP rear camera and a VGA front-facing shooter. The tablet comes in colors such as black, marine blue or punch red and is backed by a one-year limited warranty and service. If you’d rather have a tablet that has a smaller physical footprint, but still lets you access the entire iOS app ecosystem, the iPad Mini 4 is the compact tablet to get. With a 7.9-inch screen size, Apple’s iPad Mini 4 is small enough to be tossed in a backpack and carried anywhere. With a resolution of 2048 x 1536 pixels, the screen is quite sharp and vibrant. It also comes with a fingerprint-resistant oleophobic coating. Despite having “Mini” in its name, the iPad Mini 4 is anything but. Under its hood is Apple’s A8 chipset with 64-bit architecture. There’s also the M8 coprocessor for gathering/processing data from the tablet’s many sensors. Add in 2GB of RAM and 128GB of internal storage, and you’re set for multitasking on the go. 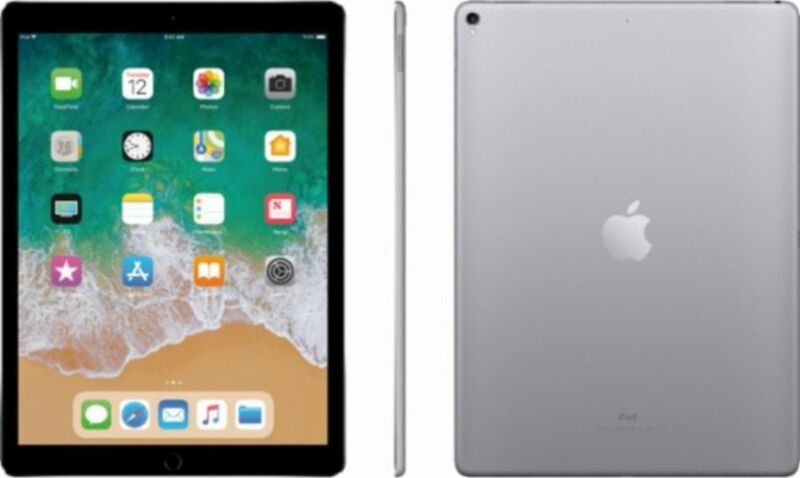 Even though it ships with iOS 9 out-of-the-box, iPad Mini 4 can be updated to the latest iOS 11, thus letting you enjoy all the enhanced multitasking features and enterprise security controls that the release has to offer. For connectivity, Apple iPad Mini 4 supports 802.11a/b/g/n/ac Wi-Fi, Bluetooth 4.2 and LTE (optional). There’s also Wi-Fi calling included. Touch ID lets you secure your data, as well as your App Store purchases with biometric authentication. For photos and video-calling duties, iPad Mini 4 has an 8MP (f/2.4) autofocus rear camera, as well as a 1.2MP (f/2.2) front-facing snapper. You also get dual microphones and stereo speakers. Apple iPad Mini 4 is backed by a one-year manufacturer’s warranty on both parts and labor. If you’re looking for a compact, Android-based tablet that you can count on for all your work-related needs, get the Samsung Galaxy Tab A.
Samsung Galaxy Tab A is powered by Samsung’s own Exynos 5433 octa-core chipset and has 2GB of RAM. You also get 32GB of onboard storage, expandable via microSD cards. This makes the tablet ideal for basic to somewhat-heavy office-related work. Since Samsung Galaxy Tab A runs Android 7.1 Nougat out-of-the-box, you get access to advanced features such as split-screen multitasking and bundled app notifications. Having an eight-inch display of 1280 x 800 pixels resolution, the Galaxy Tab A includes Wi-Fi, Bluetooth and USB Type-C as major connectivity options. There’s also a 3.5mm audio port included in the mix. For photos and videos, Samsung Galaxy Tab A features an 8MP rear camera and a 5MP front-facing camera. A 5,000mAh battery backs up the whole package.